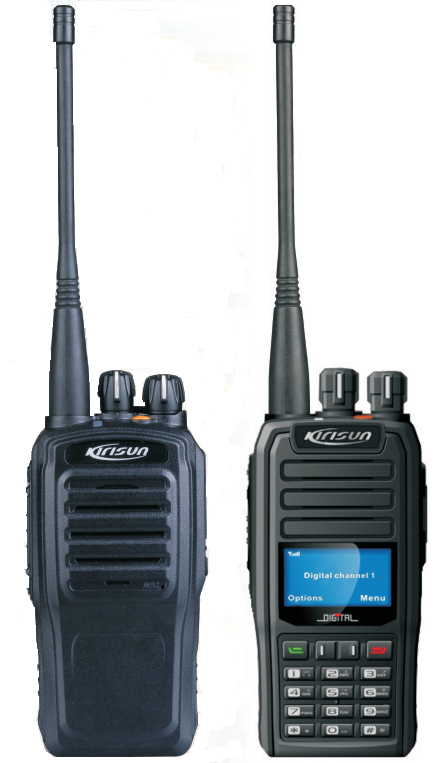 Recently, Kirisun have released some dPMR446 radios. These are designed to work in the License free band just above the normal PMR446 allocation in Europe. What's great about this is that you don't have to worry about getting a license (or not getting one for some people!) and can legally use them throughout Europe. I usually make a blog post for any radios I come across on the web that look promising, so I thought I'd write about these radios too. These radios are perfect for non technical users, who just want a radio to work, but they also have some fun functions for the technical user such as FPP (Front Panel Programming) if you have the password to unlock it! The model numbers for these 2 radios are FP520S and FP560S. As is common with radio products, there is a display version and a non-display version. The display version is the one with the higher model number. Now, let me just warn you, these products are a lot more expensive than normal analog PMR446 radios, but they are cheaper than the Icom IC-F4029SDR, which had been around as the only dPMR446 radio for quite a few years with no competitors. I also recently found out about the Kenwood TK-3401D which, with a list price of £191, is a tiny bit cheaper than the Icom. The Kenwood can currently be found on the internet for £155 (seems to be a special offer) which makes it quite a bit cheaper than the Icom. The Kenwood does not have a screen or keypad though. The Icom and Kenwood use the same vocoder, and the same dPMR446 standard, so theoretically they should work together. The Kirisuns use a different vocoder so won't be able to hear or talk to these radios in digital mode. The Kirisun FP520S has a list price of £169 + VAT, and the FP560S has a list price of £189 + VAT. Although this is just a list price, and I'm sure, just like the with Kenwood, it can go down a bit. That brings the total number of dPMR446 radios currently available to 4! The old Icom, the new Kenwood, and the 2 new Kirisuns. Kirisun originally wanted to use the AMBE+2 vocoder, but then changed their minds and decided to use the newer and (apparently) slightly better sounding N100 vocoder. Of course, the benefit of this is that it should sound better, but it also means that it won't work with either the Icom or the Kenwood dPMR radios. I couldn't find any additional information on this vocoder at the time of writing, so if you find anything, please leave me a comment so I can update the post.